It is not mere coincidence that the year 2012 marks the 100th anniversaries of both the Greenwich Art Society and the Bruce Museum. Their histories in the early decades are closely intertwined and the Bruce Museum is delighted to collaborate once again with the Greenwich Art Society to celebrate these honored milestones. The new exhibition Coming Full Circle: The Greenwich Art Society Celebrates 100 at the Bruce Museum will highlight each decade of the Greenwich Art Society’s history through 43 paintings, drawings, prints and sculpture by the most distinguished members who were exhibiting artists and/or teachers, such as Leonard, Mina Fonda and Dorothy Ochtman; Childe Hassam; Simka Simkhovitch; Margaret Brassler Kane; Ann Chernow; and Leo Manso. 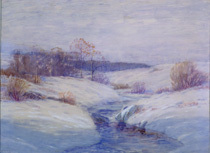 Many of the works are drawn from the Bruce Museum’s collection. At the end of the nineteenth century, as wealthy New Yorkers sought to move out of the city, the town of Greenwich was changing from a country village to a stylish suburb with its own established artists’ colony and a growing market for art. 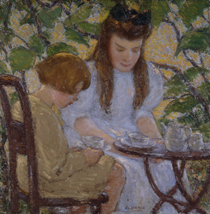 Theodore Robinson and John Henry Twachtman taught summer art classes at the Bush-Holley House, and Twachtman as well as Leonard Ochtman had settled permanently in Greenwich. In 1912, the Cos Cob School artists, as they were known, formed the Greenwich Society of Artists, whose purpose was “the promotion and maintenance of the fine arts and the exhibition of works of art in Greenwich.” Led by Edward Clark Potter and Leonard Ochtman, early Society members included Mina Fonda Ochtman, Matilda Brown, Charles Ebert, George Wharton Edwards, Elmer MacRae and Henry Bill Selden. At the same time, the fledgling Bruce Museum was looking to open its doors with its first exhibition. The Society responded by turning one wing of the building into an art gallery and held their first show there in September 2012. In fact, until 1926, the Greenwich Society of Artists organized all the Bruce Museum’s art exhibitions with works by GSA members and invitational shows by non-members. The nucleus of the Bruce Museum’s nascent art collection was formed through purchases and gifts from these exhibitions. In 1956, the Society expanded its mission: “to further art education and to awaken and stimulate interest in arts and crafts in the Town of Greenwich by means of classes, demonstrations, lectures and exhibitions.” The Society became a non-profit organization and changed its name to Greenwich Art Society, opening an art center with classes. The Art Center moved several times until it finally settled in 1981 in Old Town Hall on Greenwich Avenue. To this day, it remains a thriving organization with a full program of art classes for adults and children, and several exhibitions for its members as well as open-juried shows. The exhibition Coming Full Circle: The Greenwich Art Society Celebrates 100 at the Bruce Museum is organized by Bruce Museum Director of Exhibitions Anne von Stuelpnagel and Michelle Rudolph of the Greenwich Art Society and art teacher with the Greenwich public schools. The show is supported by the Charles M. and Deborah G. Royce Exhibition Fund. Click here to see more images from the exhibition.